On-Demand Training offers highly specialized training specifically for leaders, managers and coordinators of volunteers. Choose from a wide variety of training topics based on trends and needs of volunteer programs – combine topics to create your own custom training experience. Great for regional/provincial meetings of your chapters or groups, and also ideal for organizations with lots of staff who work with volunteers. 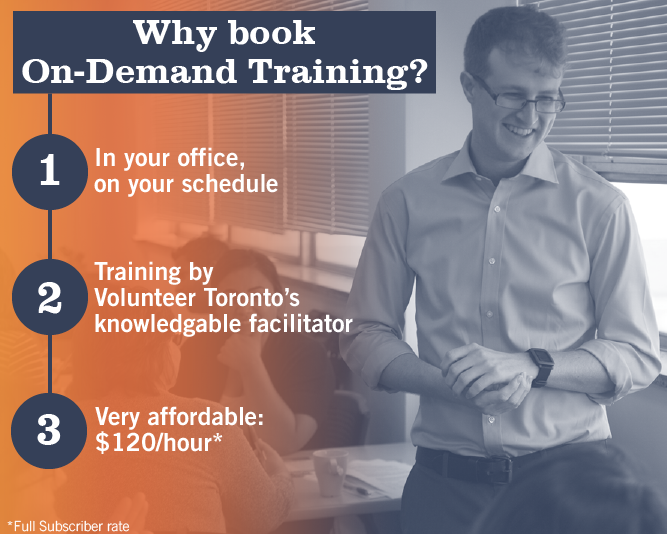 On-Demand Training brings Volunteer Toronto’s training expertise to your facility or location, on your own schedule. Get access to the knowledge gained through Volunteer Toronto’s decades of work with non-profit and charitable organizations to help improve your volunteer leadership and program. You could spend upwards of $500 sending your staff to training sessions that can take up a whole day. Save time and money by getting specialized training for volunteer managers, coordinators and staff specific to your needs for only $120/hour for Full Subscribers. Getting volunteers engaged with your organization is the first step to creating and maintaining an amazing volunteer program. Learn about a variety of techniques to connect with and recruit volunteers of all kinds. Looking to recruit youth? Seniors? New grads? Newcomers? Learn more about the potential volunteer audience of your choice to ensure you’re reaching the right crowd. Creating position descriptions can help you attract – and retain – great volunteers. Learn how to design your volunteer positions with risks, retention and recognition in mind. Do you know the 10 steps for volunteer screening? Learn about the necessary steps ensure your volunteers are the right fit for the role and your organization, from application to interview to selection. Are you asking every volunteer to get a police reference check? This may be against the law – learn about how, when and why you ask for police reference checks and/or vulnerable sector screenings from your volunteers. Every volunteer’s work should start with an orientation, followed by role-specific training to allow volunteers to effectively and safely perform their duties. Learn where to start with training your volunteers, and how to keep them learning. Once you’ve engaged great volunteers, you need to find ways to keep them motivated and staying with your organization. Learn about the barriers to retention as well as new ideas for keeping your volunteers engaged. What makes a volunteer "difficult?" How can we guide them on the right path? Learn how boundaries, policies & procedures and feedback can help you deal effectively with those challenging volunteers. How can you communicate the value of volunteers in a meaningful way? Explore the concept of social accounting using nation-wide data on volunteering along with local examples to showcase how volunteers make every organization better. Learn about the four types of boundaries you need between volunteers and clients, staff and even other volunteers. How do you enforce them? What happens when a volunteer breaks a boundary? Discover the tools you need to ensure effective boundaries. Meaningful recognition goes a long way to keep volunteers engaged, motivated and making an impact. Learn how to recognize your volunteers in effective, inexpensive and far-reaching ways. Your volunteers are a vital member of your team – when something goes wrong, you need to work with them to help them succeed. Learn about performance management techniques for your volunteers to coach them to better performance. A program evaluation can help you identify areas of success and strength along with weaknesses in your volunteer program. Learn the basics of program evaluation planning to help you identify where – and how – to grow your program. The cornerstone of a successful volunteer program is appropriate representation of your community. Learn how to ensure you’re recruiting and including diverse volunteers and creating a discrimination-free volunteer program. Volunteer Canada’s CCVI is the guiding roadmap for the volunteer management profession. Learn about the values, principles and standards of the CCVI and how you can use it to improve your volunteer program and your organization. Sometimes, dismissal is the only way to deal with some volunteers - but you should ensure you have the right policies and procedures in place first. Learn the proper steps of volunteer dismissal without breaking any rules. Get your staff trained on this great free tool to create easy, customized certificates to recognize your volunteers. Learn how the Achieve Ontario (formerly PREB-Ontario) system works and how to produce certificates in this interactive session.